Recently, I received an email about a very unique company called My Own Pet Balloon which offers children who may be physically unable to have a pet due to a disability or illness the ability to have a pretend pet. While I hadn't heard of My Own Pet Balloon prior to receiving an outreach email, the more I learned about it the more interested I became. 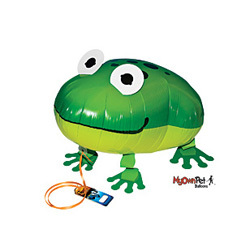 They're not just any balloon, they're made with high-quality materials, welded seams and special inflation valves designed for long-lasting fun. Interestingly, it's the brainchild of Treb Heining who is also responsible for dropping the confetti on Times Square here in NYC - small world! There is a unique bond between children and their pets and beyond offering My Own Pet Balloon a partnership's been formed with Canines for Disabled Kids in which for every My Own Pet Balloon purchased here, $5 will be donated to Canines for Disabled Kids.